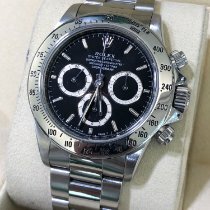 Another lovely, original Rolex Daytona Cosmograph, model reference 16520. This is the very collectable 'Zenith Daytona' as it uses the El Primero base calibre. This S series watch has the mk3 'Inverted 6' dial. The watch is in excellent condition, the case has strong lines and has not been over-polished. The bracelet (T3 march 1995 code) is full length and stretch free. The watch was serviced at Rolex in 2013 (Rolex service card included) and has barely been worn since. These watches are highly collectable. If you are considering buying, call Dominic for more information. 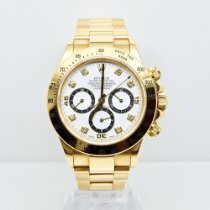 We will take all types of quality watches as a part-exchange.